This is a one-bedroom suite with private bath equipped with a microwave, coffeemaker and a small refrigerator. It has a relaxing sitting room which opens out onto a patio which overlooks the city. The bedroom can be set up with either two single beds, or one king bed. The sitting room couch also pulls out into a full bed, allowing the apartment to accommodate up to 4 persons. The suite is finished in the colonial style, with extensive tile, wood beams, and hand carved doors. It is in the protected central historic district, and was recently restored with modern plumbing and electrical, and wireless broadband service. 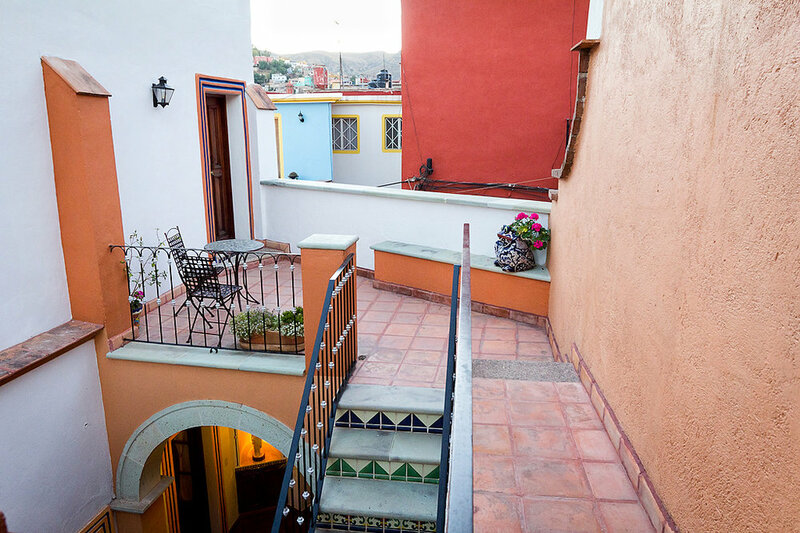 It is located a few blocks away from the Plaza de la Paz, the Jardin and the Mercado Hidalgo. It is an easy stroll to the Teatro Juarez, and another block or so to the Teatro Principal (see map).